A Calling Device is a phone you can choose to make your calls using turboDial. It can be any phone that has a phone number, including your desk phone, mobile phone or home phone. The first source is described in the “Adding a Caller ID” section. Each added Calling Device number is associated with the logged in User who added it. Each User has an independent list of added Calling Devices. Calling Device numbers are not verified by Twilio. You can enter an extension with the phone number you want to setup as a Calling Device. Include the extension after the phone number, and prefix the extension with a blank space and an ‘x’. For example: +13125551212 x1213. When you make a call using a Calling Device that has an extension Twilio starts by calling the phone number, then waits for answer, and then enters touch tones (DTMF) representing the extension. The Calling Device will then ring and when you answer the call will proceed to connect to the person you are calling. If you experience problems getting your Calling Device extension to ring when making calls then you should experiment with adding ‘pauses’ before the extension is dialed. You can add a pause by including a ‘w’ in the extension. Each ‘w’ equates to a 1/2 second pause. For example, an extension entered like this: +13125551212 xwwww1213 will result in 2 seconds of delay after the initial answer before the extension 1213 is dialed. When you select a Calling Device and initiate a call turboDial will first place a call to your Calling Device. The Caller ID number turboDial uses for that call to your Calling Device will be the Caller ID number you have chosen for the call, unless the Caller ID and Calling Device number are the same. 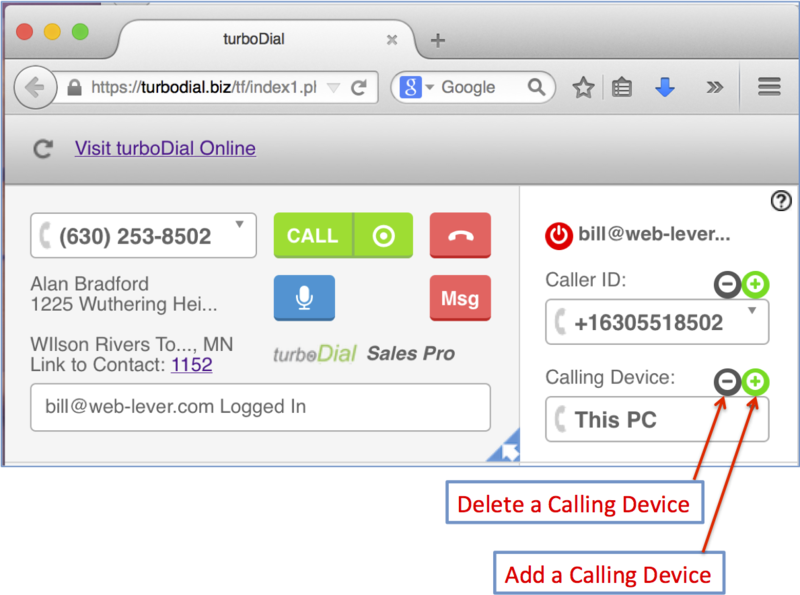 See this article for more information on how turboDial handles the case where your Caller ID and Calling Device number are the same.